I hope you’ve stocked up on applesauce, because yet again we’re baking with this simple pantry ingredient. If you’ve made the morning glory muffins or applesauce muffins, then you’ve probably realized why I have such a deep love for this simple ingredient. Applesauce not only adds incredible moistness to baked goods, it also provides a natural sweetness to typically over-processed treats. This means a less-processed sweetener, like honey or maple syrup, may be used without compromising on the sweetness or texture of a baked good. When it comes to making speciality treats that are only enjoyed a few times a year, like cake, I’m personally okay with using a refined organic sugar (like cane sugar). In fact, I’m also okay with occasionally breaking out the white flour (this white flour bread is a favorite treat in our home). After all, a treat is meant to be just that: a treat! A treat isn’t consumed because of the nutrients, and it isn’t meant to be a daily or even weekly food. A treat is meant to be enjoyed, savored, and celebrated. I think this idea is missed in our ready-to-go treat society. Gone are the days of baking treats in home kitchens, which requires time and attention to the process. Today, most people just run to the store and grab cookies or cakes off the store shelf. This convenience factor is amazing, but it’s also led our processed food society to over-consuming treats that were once reserved for weekends (remember Sunday night dinner? ), birthdays, and holidays. When it comes to making an occasional treat, like chocolate or vanilla bean cake, I’m okay with using these more refined ingredients in an effort to maintain a treat’s integrity (the taste and texture). 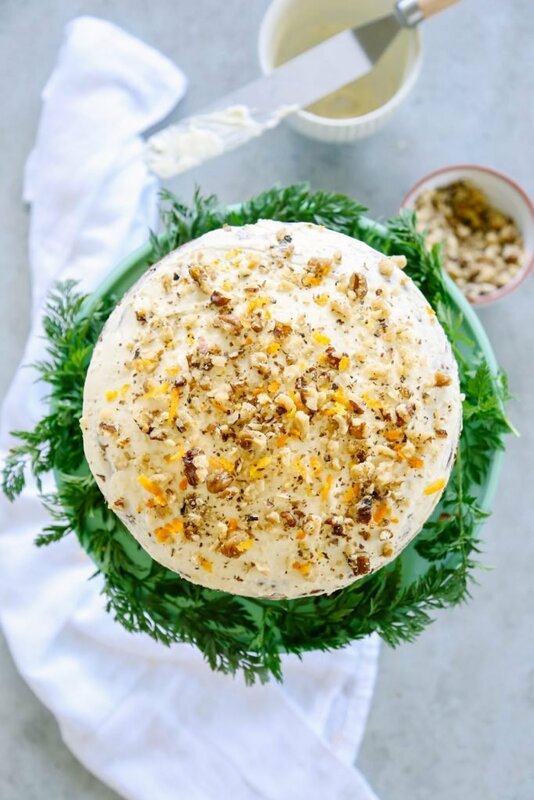 Some treats, like carrot cake, naturally lend themselves to less-processed ingredients without compromising the integrity of the treat or complicating the baking process. Carrot cake naturally lends itself to being a “healthier” dessert. When the first word in your name is carrot, I just expect more from you than processed sugar and white flour. Amen? Amen! 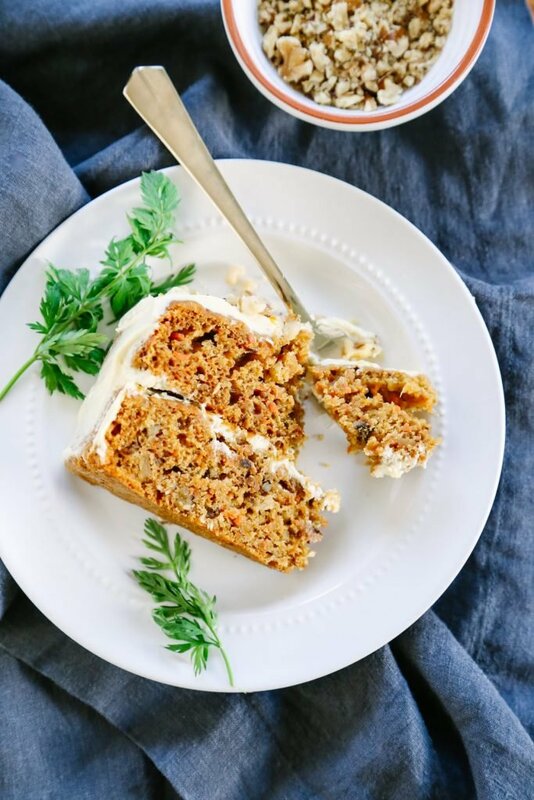 By replacing the white or brown sugar and white flour with less-processed ingredients (like whole grain flour, applesauce, and honey), carrot cake naturally gets a “healthy” face-lift. 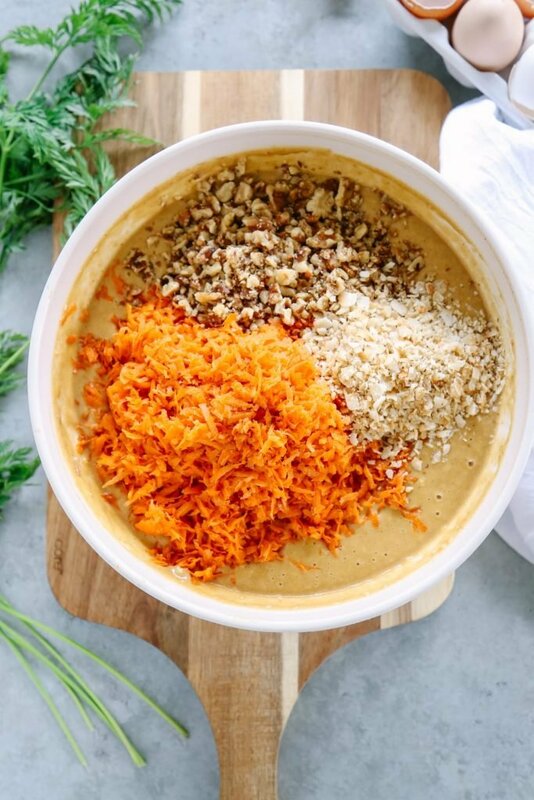 A face-lift that transforms carrot cake from an occasional treat to a daily breakfast. Okay, maybe that’s just going too far. Not that I’ve tried to consume carrot cake for breakfast over the past few weeks. Maybe just a few times. Of course, it’s all in the name of recipe testing/perfecting ;)! All this cake talk isn’t in vain, because today’s recipe is a cake recipe! I know, that’s kind of a different recipe topic for this blog, but since spring is here and Easter is just a few weeks away, a classic springtime cake just feels appropriate. 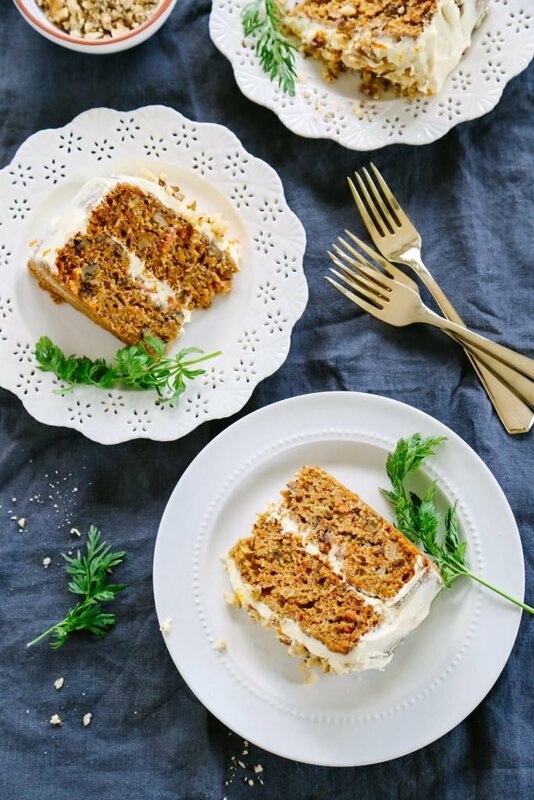 I was actually going to wait and share this recipe next week, but I simply can’t wait any longer to serve you a big slice of this healthier, breakfast-worthy carrot cake! Wait, maybe healthy gives the wrong impression. Let’s go with real foodified, okay? 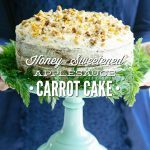 As the name implies, this Honey-Sweetened Applesauce Carrot Cake is made with natural sweeteners: honey, applesauce, and freshly-grated carrots. The combination of the three ingredients not only escalate this classic cake to a real food status, but also result in a super moist cake. And for me, a super moist carrot cake is a must! To take this treat from basically a giant muffin to full cake status, a simple frosting of cream cheese, butter, and honey is spread over the top and sides of the cake. 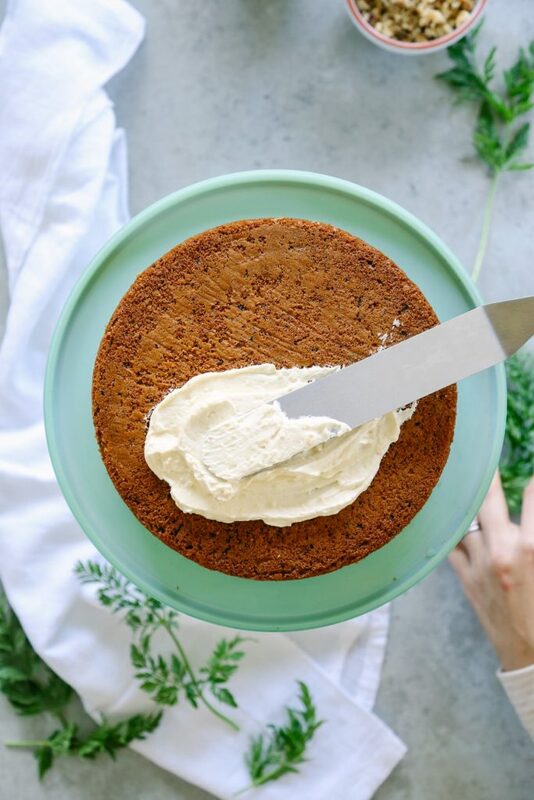 And since carrot cake is meant to be rustic, the frosting doesn’t need to be perfect or fancy, so spread away! We’re embracing real food imperfection with this cake. 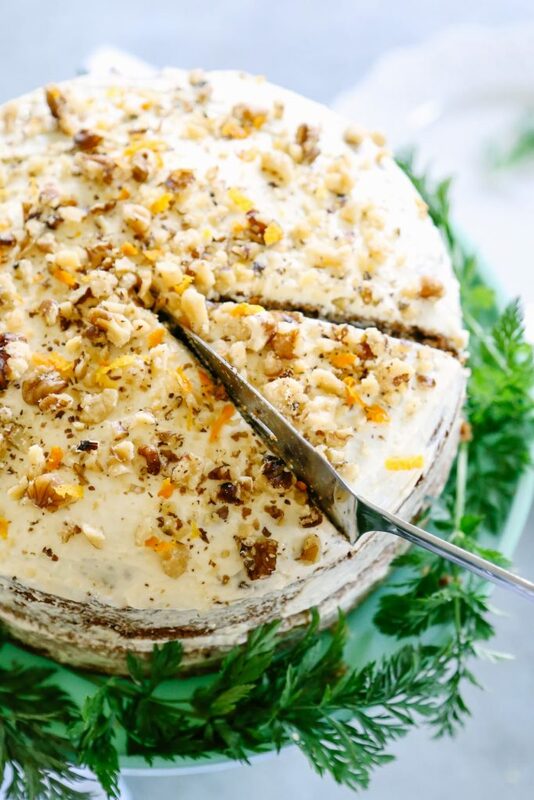 Who’s ready for a slice of naturally-sweetened, super moist carrot cake? Grab the homemade lattes, I’ll slice the cake. 8 oz cream cheese I like Nancy's or Organic Valley. In a large bowl, whisk together the dry ingredients: einkorn flour, baking soda, baking powder, cinnamon, ginger, nutmeg, and salt. Set aside. In another large bowl, whisk together the wet ingredients: melted butter, honey, applesauce, eggs, and vanilla extract. Whisk vigorously for about 30 seconds, until the honey is combined with the other ingredients. Pour the wet ingredients into the dry ingredients, and gently stir until all the ingredients are well combined. Add the grated carrots, chopped walnuts, and shredded coconut to the batter, stirring just until combined. Let the batter rest for about 10 minutes. Meanwhile, grease 2-8inch cake pans with butter and then sprinkle each with flour. Shake off the flour. This will help the cakes easily slide out of the pans once they are cool. Pour the batter into the cake pans. Bake for 40 minutes. Insert a toothpick into the cakes to test for doneness--they should come out clean. Meanwhile, make the frosting. In a stand-mixer (you can also do this with muscle power and a wooden spoon), beat together the softened butter and honey using the paddle attachment. Once the butter and honey mixture is smooth, add the cream cheese and continue to beat the frosting until smooth. You can also use the whisk attachment for this step, but I've found the paddle attachment does a better job at removing any butter chunks. Place the frosting in the fridge until the cakes are cool. Let the cakes rest in the pan for about 25-30 minutes, then flip the pans over to remove the cakes. Allow the cakes to fully cool. Slice the top off one cake, then gently flip the cake over onto a plate or cake stand. Frost the top and sides of the cake, then add the second cake, and continue frosting. Sprinkle the top of the cake with extra chopped walnuts (toast these in a pan on the stove-top for an extra treat) and orange zest (my favorite addition). Due to the frosting, this cake needs to be kept in the fridge. This recipe will yield enough frosting to lightly frost the cake, but not enough to create a thick frosting. If you’d like a thick layer of frosting around the cake, I recommend doubling the butter and cream cheese amounts, but only increasing the honey to 1/3 cup. Taste the frosting, and add more honey if needed. I’ve found that 1/3 cup of honey is sweet enough for this frosting. Einkorn looks and tastes similar to white flour, so it’s the perfect healthy flour to use when making cakes, cookies, and bread. Einkorn is sold in some health food stores and online. If you don’t have access to einkorn, whole wheat pastry flour may be a substitute in this recipe; however, I haven’t personally tried making this flour swap. One reader found that whole wheat pastry flour produced a dense cake, so keep this in mind if you make the swap. This is utterly gorgeous!!! And I’m loving the naturally sweetened element so much! Thanks for this gorgeous and sure to be tasty recipe! Made this…my husband said, “This is how cake should be!” This was my first time using Einkorn. I am new to your website and am loving it! I am inspired. That’s awesome, Julie! I’m so glad your husband enjoyed the cake. It’s so great to hear that your first time using einkorn was a success–it’s a great flour! I made this for my husband’s birthday. Since he doesn’t care for coconut, I substituted crushed pineapple that had been drained and squeezed, and I also had to substitute half maple syrup/half xylitol for the honey. He pronounced it the best carrot cake he had ever tasted. Thank you for sharing. That’s so great, Len!! I’m so glad the substitutions worked so well. Happy happy birthday!!! Yay, Jamie! I’m so glad you loved the cake!! The cake stand is a cheaper version of the classic Jadeite Jade Green Milk Glass Cake Plate http://amzn.to/1XO4wgW. I’ve loved that brand for many years, and I found a knock-off at HomeGoods last year for $16. I was so excited! It’s my go-to cake stand for holidays and birthday celebrations. I made this cake with whole wheat pastry flour, Maple syrup and fresh pureed pineapple insteàd of applesauce, honey and einkorn. With all the rave reviews I have to say my expectations were high and were not met. It smelled wonderful baking, but since it was dense and a little bland, I would recommend adding another tsp of baking soda, and another half tsp of Salt. (Another recipe I have uses these measurements and only 2 cups of flour.) Also the Frosting was much more buttery than I like, next time I would use half the Butter. All of the spices and carrots, Coconut and Walnuts went lovely together I’m sure applesauce would have been great, the pineapple was nice too. I loved how the cream cheese and honey tasted together in the Frosting. Hey Bethany, Thanks for the suggestions about the extra teaspoon of baking soda and salt when using whole wheat pastry flour. 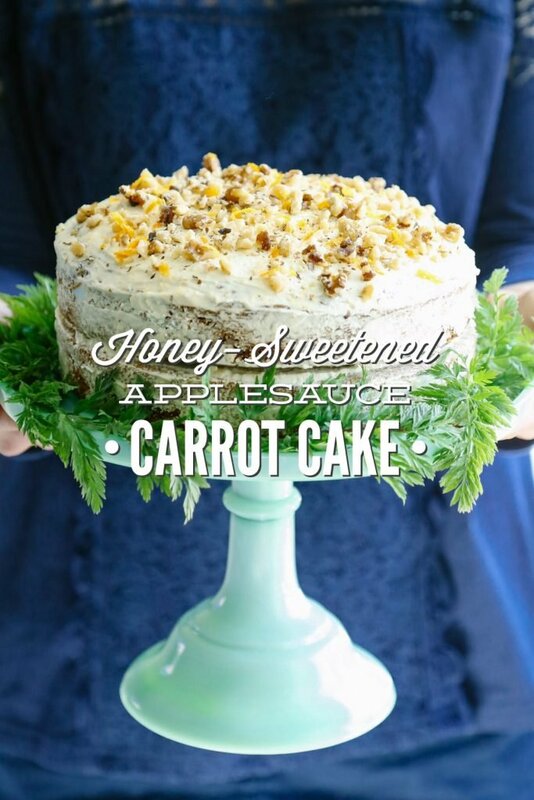 I’m sorry to hear the changes that you made didn’t live up to your expectations for the honey applesauce carrot cake. Hi Kristin, Thank you for introducing me to Healthy Seasonal Recipes! I would like to add, the longer my cake sat, the more pronounced the flavors became. So if someone else, like me, doesn’t have einkorn and wants to use Whole Wheat Pastry Flour. I would suggest he or she make the cake a couple days ahead of when he/she plans to serve it. Also, I think it’s the pineapple that requires the extra salt, so if one uses applesauce as per the recipe, it may work just fine with the WWPF. I feel like the Maple syrup made it just sweet enough without giving me a sugar rush. I didn’t use honey because I recently read that when honey is heated, the chemical change makes it toxic to the body. I have experienced this when I used to put honey in my hot tezan before I cooled it. It made me sick to my stomach, so when I read about this study I felt it had merit. P.S. The cake did make a delightful breakfast! You’re welcome, Bethany! Healthy Seasonal is such a fantastic resource for baking with maple syrup. Yay for eating cake for breakfast! That’s awesome, Hadassah! Happiest birthday to your daughter!! Could this be made without walnuts? Hey Melissa, I believe so. If I cut this in half to make a smash cake with four 4-inch layers, how long do you think I’d need to bake the cakes? Thanks! Hey Megan, Hmmm, good question. I think that’s definitely possible. Maybe 20ish minutes for each one? Do you think flax eggs would work or should I use egg whites? The yolk bothers me. I was also going to replace the applesauce with pumpkin since I cannot have applesauce. I am excited to make this for my birthday. Hey Anne, I’m not sure. For baking recipes, I can’t really say for sure if substitutes will work unless I’ve tested them out. If you try these subs, let me know how it goes. Do you think it would work in a bundt pan? Hey Anne, I’m not sure. I haven’t tested this recipe in a bundt pan. The cooking time may vary slightly. Thanks you so much for this recipe! The cake was delicious! We don’t have access to einkorn or pastry flour so I subbed regular whole wheat flour. I added 1/2 tsp baking powder and subbed maple syrup for honey in the cream cheese frosting. It turned out great, the flavor was perfect. I’ll be using this recipe for years to come!